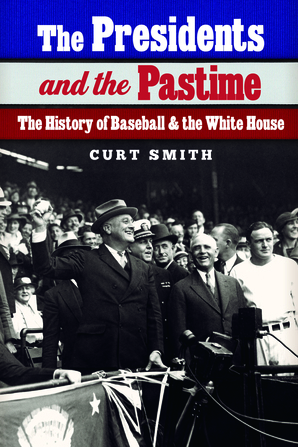 Acclaimed author Curt Smith chronicles the historic relationship between baseball and the U.S. presidency. 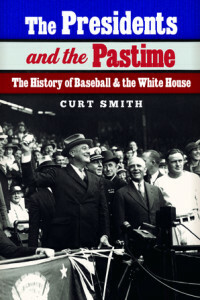 Smith’s new book, The Presidents and the Pastime: The History of Baseball and the White House (University of Nebraska Press) is now available. Described by USA Today as “the voice of authority on baseball broadcasting,” Smith draws on his background as a former White House presidential speechwriter in his latest book. Beginning with the Revolutionary War, Smith charts how baseball became America’s pastime. Each chapter, rich in anecdote, depicts a president’s special relationship to the pastime. For Woodrow Wilson, baseball supplied a refuge from strokes that ultimately took his life. Warren Harding drank bourbon in the White House with Babe Ruth while backing Prohibition. A heroic Franklin D. Roosevelt saved baseball in World War II. Ambidextrous Harry Truman threw the first ball left-, right-, and both-handed. Richard Nixon was offered the post of baseball commissioner. Among many captivating stories, Smith describes John F. Kennedy, 43, meeting Stan Musial, 39. “They tell me you’re too old to play baseball and I’m too young to be president, but maybe we’ll fool ’em,” said JFK. Smith also provides a unique picture of our modern presidents. George H. W. Bush idolized Lou Gehrig and coached the game. Bill Clinton grew up listening to Cardinals voice Harry Caray. George W. Bush threw a perfect strike in the World Series in the wake of 9/11. Barack Obama took the mound at the Nationals’ D.C. park, revealing a hometown White Sox cap to show how all politics is local. Before becoming president, Donald Trump often performed the first-pitch rite but has not done so on Opening Day in office. The Presidents and the Pastime provides a narrative of how America’s leaders have felt toward baseball—and what baseball must do today to thrive in the larger culture. For more information visit, www.CurtSmithUSA.com or purchase the book on Amazon, Barnes & Noble or Books-A-Million.